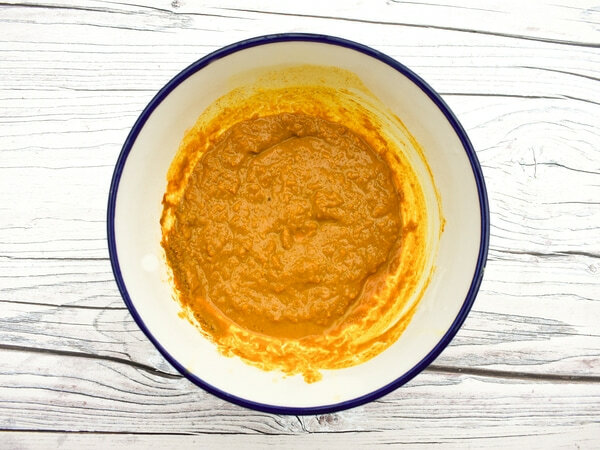 Tandoori paste is a really popular Indian marinade. It is mostly commonly used in a chicken dish, but of course it's the perfect marinade for veggie dishes too. Vegetarians could coat halloumi in it before crisping it on the BBQ and vegans can use it to marinade tofu before grilling it. You could also use it to marinade onions wedges and cook those on the BBQ. The word tandoori comes from the word tandoor, which is the oven a tandoori is cooked in. 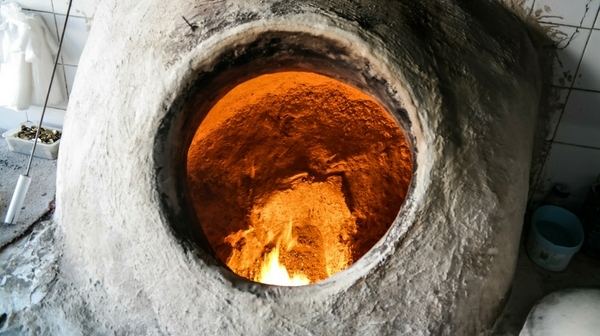 The tandoor is a clay oven (nowadays these can be metal) that is traditionally used in Pakistan and India to cook and bake. It's an outdoor oven and it's still popular today. It takes very little fuel to heat and stays hot for a long time, so it's very economical. Wood or charcoal is burned in the bottom of these pots and when the optimum temperature is reached (and the flames are out), the food is cooked in the pot above the searing heat. These outdoor ovens are kept burning for long periods and can reach a temperature of 480c (900f). Flatbreads are thrown onto the pot walls inside the ovens where the heat helps them to stick to the side. They are peeled of when they are cooked through. Skewers (kebabs) are propped up and cooked inside the oven or across the mouth of the oven. 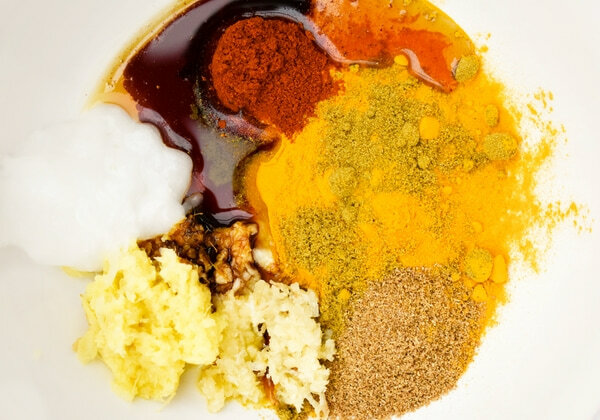 Tandoori paste is a popular marinade in India, Pakistan and here in the UK. It is also referred to as tikka or tikka masala. The main spices in this dish are always the same, but some ingredients will change slightly from recipe to recipe. Most recipes include garam masala, but I use the individual flavours in the garam masala. Chilli is also added, but I keep my masala on the milder side as I have a child who doesn't like things too hot. When you make it you can add more chilli to suit your taste. The spices are mixed with oils and yogurt to make this creamy marinade. You could use plain yogurt or dairy free plain yogurt. I used soy sauce for the salty flavour in my marinade as I use it for marinading tofu, and salt can pull the moisture out of the tofu, but you can use salt, if you are marinating something other than tofu. Which oil to use ? I also use coconut oil instead of vegetable oil, as a healthier alternative, but again you can choose the oil you add to your marinade. Just make sure you choose a mild oil, this is not the time to use olive oil, which would overwhelm other flavours and burns too quickly. 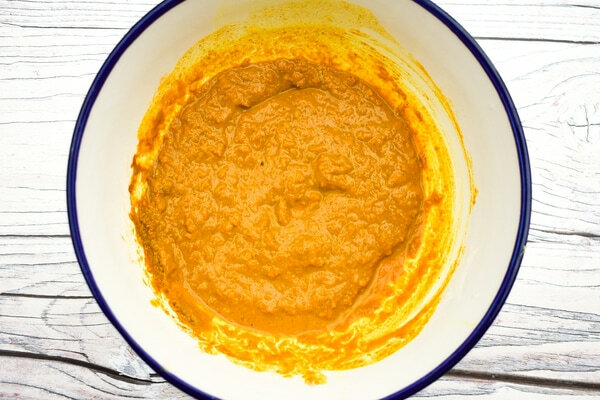 In my tandoori paste I use ground turmeric, ground coriander, ground cumin, fresh ginger (you could use ground), fresh garlic, paprika, some coconut oil (use any mild oil), soy sauce (you could use salt) to add saltiness and agave nectar (you could use sugar or honey) for a touch of sweetness. Next I add plain yogurt and enough water to bring it to the right consistency. The paste can be kept in the fridge for a few days, as can the tofu or halloumi once you have left it to marinate. A popular Indian paste which is also called tikka or tikka masala. It is traditionally used to marinade chicken, but is also a good marinade for tofu or halloumi. Mix all the ingredients together, except for the yogurt and water. This will make your paste. Keep in the fridge until ready to use. Once you are ready to marinade, add the yogurt to the paste and then enough water to get the right consistency, approximately 2-3 tbsp. 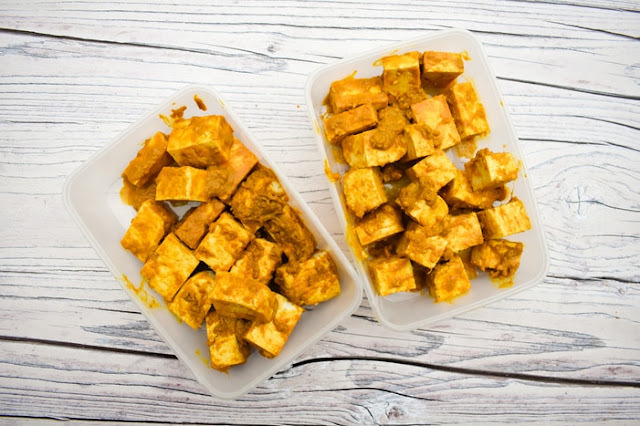 Mix your tofu, halloumi or vegetables in the marinade, spoon into an air tight container and leave in the fridge to soak up the flavours for a few hours or overnight. The cook in a grill pan or on a heated BBQ. Preparation time does not include time to marinade. This will vary according to how long you leave it and how long you have. 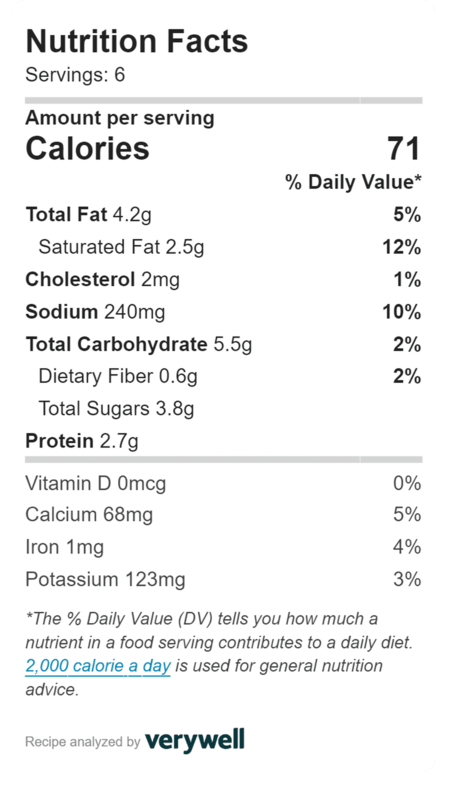 Calories and nutrition are for 6 servings of marinade. I love the look of that tandoori oven! Wish I had one too :) Saving your recipe as it's hard to find the tandoori paste where I live. My mouth is watering! I love tandoori - so much flavor. I want that whole container of tofu now! Haha thanks, I'm so glad you like it. I love tandoori - this is such a handy sauce to have one hand - thanks so much!! Yes it can be used with a lot of different things. I am thinking a mushroom curry with it next. I absolutely need to make this Tandoori paste. I always have the ingredients on hand, so win win! Thanks for sharing such a great recipe! We love making our own tandoori paste. It's so much cheaper than buying it isn't it.